Only 10% of homeless Americans vote each year, but they can still make a difference in elections. Having a home is not a prerequisite to vote in the United States. But activists and homeless service providers still face major challenges trying to help homeless Americans register. Pitts v. Black (1984) and several subsequent cases in the 1980s and ’90s established that homeless people could not be denied the right to vote because they did not live in a traditional residence. A shelter, park or street corner can be designated as a residence. In states that require a mailing address for voter registration, homeless voters can usually use the addresses of shelters, churches, friends’ houses, or P.O. boxes. This is unfortunate, because homeless voters can make a difference. 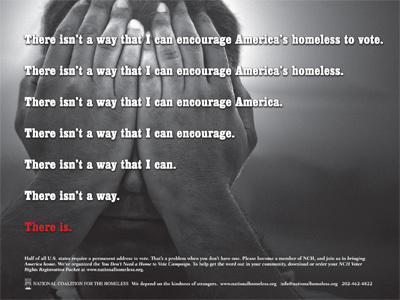 As the 2012 presidential election nears, issues that are relevant to homeless Americans, such as economic inequality, healthcare and job creation, will continue to shape the national debate. Although the homeless vote may not be a wild card for any candidate or party, with at least 1.6 million people experiencing homelessness nationwide, it does have the potential to change the game in some swing states. Some advocates believe the real impact of the homeless vote lies in local elections. “Americans are most interested in national elections, which is ironic in a sense, because local elections are the ones that affect…your day-to-day life the most,” said Devo’n Williams of Homeless but Not Powerless, an advocate group that pushes for greater homeless engagement in local elections. Indeed, local legislation and policies about funding, housing, healthcare, transportation, and employment can often have a greater, more direct impact on homeless people’s lives than national policy. Sill, the upcoming presidential election is a great opportunity for activists to raise awareness for the cause of homeless suffrage. From September 30 to October 6, NCH will sponsor the National Homeless and Low-Income Voter Registration Week to help its 4,000 organizations across the country boost voter registration. NCH has sponsored the week-long event every presidential election year since 1992 as part of its You Don’t Need A Home to Vote campaign, which has helped register tens of thousands of homeless voters. This year, activists may have to work harder, for new voter ID laws and other restrictions introduced to states across the country will make it more difficult for some homeless Americans to vote. At least 34 states introduced laws that require photo ID for voter registration; at least 17 states introduced laws that require proof of citizenship such as a birth certificate. For homeless people, who do not have a steady residence, keeping documents such as a birth certificate is a challenging if not insurmountable task. Many also cannot afford the fees to apply for an ID. Some states also introduced bills that would make voter registration harder by restricting voter registration drives, eliminating election day registration, reducing early voting periods, or making it harder to restore voting rights. Civil rights activists often organize voter registration drives to help and mobilize the homeless to register to vote, and these bills can make their work more difficult. A battle is underway across the country over the constitutionality of these laws. We have seen new voter laws struck down or blocked as unconstitutional in several states such as Florida, Texas, SouthCarolina and Wisconsin. At the same time, activists are working to make sure that organizations engaged in homeless voter registration are aware of the laws. “Each state has different laws, different ways of addressing voter ID, and…it is important for most groups who are planning on doing any type of voter registration campaigns, especially dealing with people experiencing homelessness, [to] start reaching out to officials and try to figure out how to address some of the problems that some people are beginning to see related to voter ID,” said Isaiah Castilla of the Alliance for Justice, a national civil rights advocacy group. Castilla recommends that activists use the Brennan Center for Justice Web site, which offers comprehensive resources for voter registration and a summary of voting law changes in 2012. NCH also published a 2012 Voter Rights and Registration Manual for organizations engaged in homeless voter registration and two weeks ago conducted a voter registration workshop during the 2012 National Conference on Ending Homelessness. “We talked about the nuts and bolts of not only how to do it, but why it’s important as well as informing people about the unique characteristics of their state,” said Neil Donovan. The workshop tuned out to be one of the most popular at the conference. In addition to having a firm grasp of the law, activists working on the ground must be familiar with the logistics of each election. Simple things like making sure that a location is open during the hours it is supposed to be open can make a huge difference. Homeless Americans are by no means a homogenous group. Despite some of the myths and misconceptions about the homeless population, many people who are homeless are technologically savvy and well informed. However, when it comes to elections, especially local elections, where there can be dozens of candidates on the ballot, learning about the platforms of all the candidates when one doesn’t have a stable home can be a challenge. That is why voter education is such a challenging but essential part of activists’ work. To prepare for Atlanta’s recent primary election, Homeless But Not Powerless posted on its Web site candidate profiles with links to candidates’ sites. However, because of a lack of funding, the group could not afford to produce print materials for individuals who do not have access to the Internet. “Primaries are just really really difficult to educate everyone, let alone a population that traditionally does not have the easiest access to the latest technology,” said Williams. Chicago’s Mercy Housing Lakefront, a nonprofit permanent housing program for people with special needs, relies on its residents to help with voter drives and education. Most of the residents in the program have experienced homelessness, and some of them used to be chronically homeless. As part of its Civic Participation Project, which helps residents reintegrate into society, residents can become “deputy registrars” and register their neighbors as well as homeless people in shelters or on the street. Residents also help research candidates and educate voters. According to Lisa Kuklinski, Mercy Housing Lakefront’s regional vice president, 75 percent of the residents in the program are registered voters. The number is about 2.5 percent higher than in the general population (72.4 percent) in the 2008 election — a great success. Jin Zhao is a freelance journalist, multimedia producer and photographer. Her work has appeared in the Nation and on AlterNet. Follow her on twitter @jinealogy and visit her blog thingsyoudontknowaboutchina.com. “If you have to show a picture ID to buy Sudafed, if you have to show a picture ID to get on an airplane, you should show a picture ID when you vote.” This is South Carolina Governor Nikki Haley’s justification for a new bill in the state that requires voters to produce photographic identification at the polls. Signed into law on May 18th, the bill also requires voters to produce a voter registration card, and one containing a photograph can be acquired for free with a birth certificate or passport. South Carolina is far from alone in passing this measure. As of date, fourteen states have passed laws requiring photo identification, with sixteen more having other proof of residence voting requirements, such as presenting a credit card, utility bill, birth certificate, or paycheck if the voter does not have another form of identification. The stated goal of most supporters of this kind of legislation is to reduce voter fraud by making it more difficult for people to vote more than once in an election or for non-citizens to vote. These measures may in fact disenfranchise many American citizens who would otherwise be able to vote. A New York Times Editorial arguing against this type of legislation cites a survey by the Brennan Center for Justice which finds that 11% of American citizens who are of voting age (21 million people) do not have up-to-date photo identification, with that percentage being significantly higher among those with low incomes (15%) and African-Americans (25%). Furthermore, this was a phone survey, so the nation’s entire homeless population was, in all likelihood, not remotely accounted for in the results. If anything, these percentages are likely to be higher among the entire American electorate. In theory, making photographic identification free, as some of these laws also do, should make it easy for citizens to acquire one and be able to vote. However, it is not that simple. Although most of these state laws have alternatives to using identification on election day, such as provisional ballots and affidavit forms, many of them still put a de facto price on voting for those who simply do not have the means to easily obtain a birth certificate, find out their Social Security number, or to make a trip to the DMV for a state-issued ID, such as the impoverished, disabled, and homeless. The key problem here, as was outlined by Professor Justin Levitt of Loyola Law School in a NPR discussion on the topic, is that “it takes ID to get ID.” Even if finances are not an issue, which they certainly are for individuals and families experiencing homelessness, it can still be “quite difficult to round up the documentation necessary to get documentation. It ends up a little bit of a bureaucratic cycle,” possibly causing voter apathy. Overall, this legislation puts even more roadblocks in the way for the homeless to vote than there already are. Even though its supporters may indeed have the noble intention of reducing voter fraud, the issue of fraud itself is virtually “nonexistent” according to the New York Times. Regardless of how large or small of a problem voter fraud actually is, the large possibility remains that a surprisingly large number of Americans, at least 21 million, stand to effectively lose their vote if this legislation spreads nationwide unless they acquire a photo ID, which is certainly easier said than done for our marginalized populations, including the homeless. To find out your state’s current voter identification laws, you can visit the National Conference of State Legislatures voter ID page. Also, New York University’s Brennan Center for Justice has an up to date report on the progress of voter ID legislation by state.